Ushers in the new-born Year. Well it's all Glory, Glory, Glory, Hallelujah ! We're going where pleasures never die. Of a grateful Morning Song. Welcome to the new-born Day. Swells with harmony and love. In the smiling meads abound. Sweetly swell the gentle breeze. Praise to thee, thou great Creator ! Printed by G. Walker, Jun., Durham. A vision appeared a ladder so high ! To raise up this ladder of mercy for me. A crown of bright Glory, is waiting for you. Of Zion's bright hill for to welcome them up. And angels will guard them, from bottom to top. To sing in the mansions, prepar'd in the skies. And thousands by faith are climbing it still. To join in their rapture their happiness share. Morning in spring - first line reads: Lo! the bright and rosy morning. 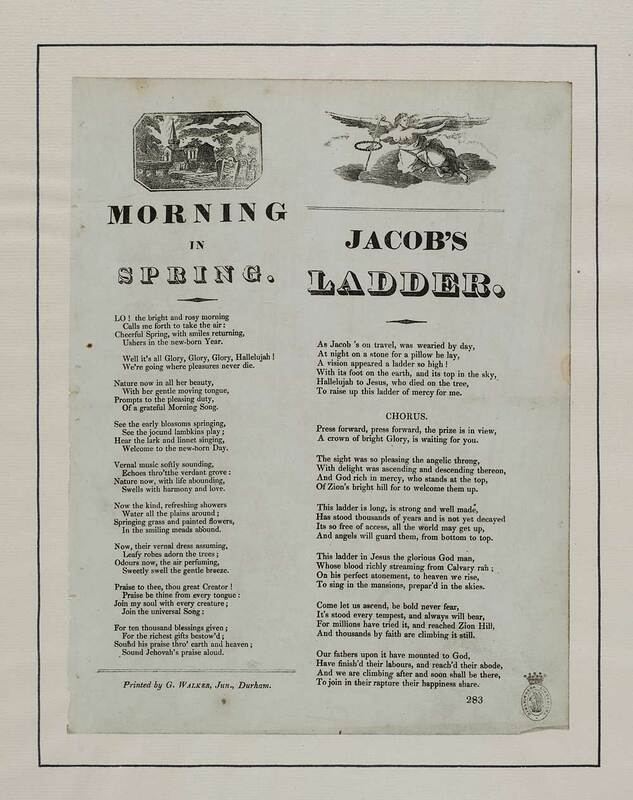 Jabob's ladder - first line reads: As Jacob's on travel, was wearied by day.